The Collector has said that the Devikulam MLA was hindering the sub collector from doing her duty as well as hurting her mentally. Lending his support to Devikulam sub-collector Renu Raj, Idukki District Collector, Jeevan Babu on Tuesday sent a report to the Kerala Government defending her actions. The Collector has pointed out that Devikulam CPI(M) MLA S Rajendran had publicly humiliated Renu Raj who was merely doing her duty. The Collector, in his report said that preventing a government official from carrying out their duty is an offence under the Code of Criminal Procedure (CrPC) and that, “the actions of the Devikulam MLA was hindering the sub collector from doing her duty as well as hurting her mentally.” He has also mentioned the fact that there are visuals which shows the MLA publicly insulting the woman official. The Collector in his report, a copy of which TNM has, also emphasises on the fact that according to a Kerala High Court order, constructions near the Muthirapuzha river should only be 50 metres away from both the sides of the river. “At the moment, the constructions are happening with a distance of just 6 metres from the river. During the time of the floods, water had entered the area and it was flooded for almost two weeks,” said the Collector. In his report, the District Collector has also said that according to a Kerala High Court order in January 2010, it was stated that it is necessary to obtain a No Objection Certificate (NOC) from the Revenue Department in order to construct buildings in the Munnar area. 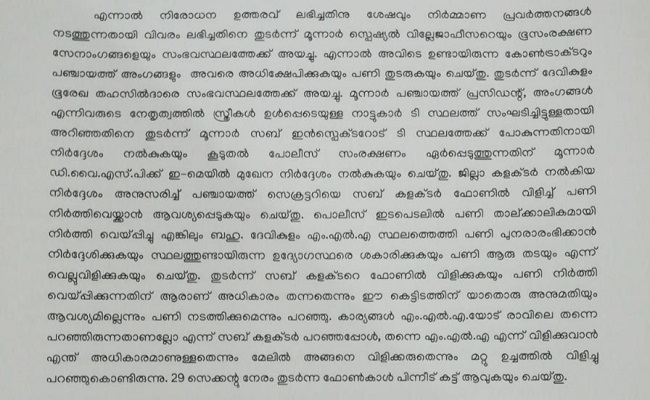 “The very day that the sub collector informed the Panchayat that they cannot go ahead with the construction of the shopping complex without getting the NOC from the Revenue Department, the Devikulam MLA came to the Revenue Divisional office and told the sub collector that her decision to stop the construction is wrong and that the construction must happen,” the Collector says in his report. The report states that when the sub collector tried to make the MLA understand that it is not legally allowed to go ahead with the construction, the MLA ignored her words and left. When it came to the notice that the construction is going on despite the “stop memo”, the sub collector, based on the directions received from the District Collector had ordered the Panchayat Secretary to stop the construction work. “It was after this, that the Devikulam MLA reached the spot and ordered to resume the construction work,” stated the Collector. “After getting angry at the officials for trying to stop the construction, the MLA also challenged them as to who is going to stop the construction from happening,” the Collector added in his report. It was following this that the MLA publicly insulted the Devikulam sub collector, by saying, “She doesn’t have brains. Just because she is an IAS officer, she is trying to act smart. People who study only to become a collector will only have so much brains.” This was recorded in various Malayalam news channels.